Robert Folsom's wrap-up of the U.S. markets. This daily commentary focuses on the following markets: DJIA, S&P 500, NASDAQ, U.S. Bonds, Gold and Silver. Weekly wrap-up of the U.S. markets. This free update focuses on intermediate-term market movements which are detailed in The Elliott Wave Financial Forecast. Daily commentary on the U.S. futures markets. This update focuses on the best futures opportunities available. Weekly commentary on global equity markets. This free update focuses on major markets in Asia and Europe. Robert Prechter and A.J. Frost's groundbreaking investment classic hailed by reviewers as "the definitive textbook on the Wave Principle." 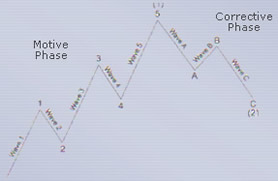 It's the most useful and comprehensive guide to understanding and applying the Elliott Wave Principle. Bob Prechter's landmark book that became an international, New York Times and Wall Street Journal and Business #1 Bestseller, is now available in a new, Updated and Revised edition. View From The Top includes key essays from Bob Prechter, Pete Kendall and media writers who were on the scene in 1997-2000, when it mattered. It includes a timing forecast for the ferocious bear market ahead. Just as important, the book spells out the mistakes along the way, and what you can learn to help avoid those errors in the future.